When I started this #100daysofblogging challenge 28 days ago, I hadn’t written published a post on this bog since January. Resultingly I was averaging about 96 unique views per month, or a little over 3 views per day. If you don’t post content, no one is going to come to your site. Well, maybe 3 people will. But even they don’t hang around long if the content is old. I have now posted for 28 days in a row. My average unique views per day has increased by more than 1100% to 34 views per day, or 1020 unique views for the month. Not including any this post gets before midnight. After performing at Back to the Roots last night at The Bakery, I haven’t been able to think much about writing today. My brain is a little frazzled. Tonight I’m performing as part of Selekt Few at the “Back to the Roots” fundraiser for the West Australian Forest Alliance. 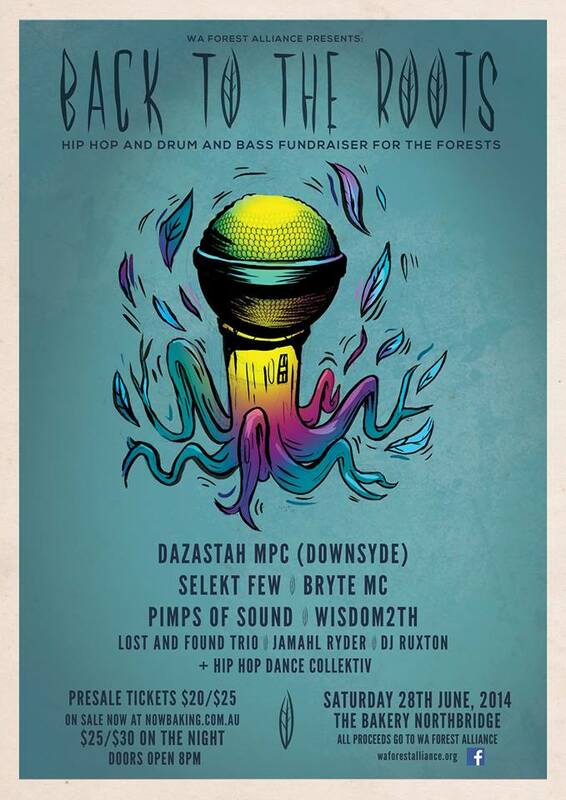 I also helped the Forest Alliance crew put together this great line up of local hip hop and other live music acts, and all proceeds from the event will go to defending our beautiful native forests in the South West. When: From 8:30pm, Saturday June 28. Image via AAP, that’s me in the green hat and shiny suit. Some #noWAsharkcull crew today visited the office of the Environment Protection Authority on St George’s Terrace, Perth. The aim was to deliver a scroll of messages and a book of photos to Paul Vogel. The messages on the scroll came from both here in Western Australia and from others around the world, all calling for an end to the shark cull in WA. The real aim was to get the campaign back in the media, and combined with yesterday’s media blow-up, it has worked. We got media for what really was just a few people with a desire to see the head of the EPA, who in my opinion absolutely should be meeting with environmental movements. If the EPA won’t even meet with us, after we break all their records for public submissions, what does that say about them? Maybe they will, we have requested a meeting with Paul Vogel between now and July the 4th, while the Public Environmental Review is still open. Today has been a long day and I haven’t the energy for any serious political analysis after work and rehearsing for the Selekt Few performance at Back to the Roots this Saturday, at ‘The Bakery’ Northbridge. So today’s post is an educational video for you to watch and from which to learn.